Last week we revisited two FX- related products that we had written about earlier on in the year. Today, we turn towards the bitcoin sector and the emerging world of trading platform and exchange providers. Among the offshoots of the spring run-up in bitcoin prices, was a wave of new products being created to offer potentially better trading platforms, merchant payment processing systems and wallets. When we covered several firms that had announced upcoming product launches, we saw uniform optimism about the future of bitcoin. However, firms also expressed caution in terms of the need to create solutions that met both fund safety and the regulatory needs of clients. In August, we reported that the bitcoin exchange, BTC-e had announced that it would be launching MetaTrader 4. Integrating their liquidity on the system, traders would be able to have access to leveraged BTC/USD trading on the world’s most popular retail forex platform. Last week, the firm officially launched the platform for live trading, following a period of it being available in demo form. According to BTC-e, the platform will provide dollar denominated accounts with the BTC/USD instrument. A 3:1 leverage will be available, with 0.5% commissions on trades. No word yet on trading of other digital currencies. Back in August, we noted that it was a development worth keeping an eye on, as the adaptation of MT4 has the potential to lead bitcoin trading to a wider audience. For many retail traders, the availability of BTC/USD on MT4 provides a familiar interface for accessing the crypto-currency market. Also, with the advent of the MT4 to MT4 liquidity gateway, other brokers using the platform will be able to connect their servers directly to BTC-e and access their pricing to also offer BTC/USD trading to their customers. In terms of competitors, technology provider, Gold-I similarly announced bitcoin MT4 integration of pricing. However, the product remains simply a price feed, without connections to actual bitcoin liquidity. We wrote about Crypto St in May, and the company’s goal to launch a ‘forex trading’ style, multi-currency trading platform. Since then, the platform was launched for open live beta at the end of July. At launch, the platform was only available for cross digital currency trades, with no USD or EUR based trades available. Taking a test drive, funding the platform with litecoins (LTC) and placing BTC/LTC, trades went smoothly. The platform includes an ‘easy’ and ‘standard’ order entry ticket. In terms of bells and whistles, the platform is still very beta, with only market depth charts included. In terms of historical charts, I was informed by the Crypto St team that it will be rolled out in the future. After seeing some volumes on the platform taking place in August, activity appears to have dried up. Primarily, this is based on the inability to fund accounts with fiat currencies, and using Crypto St as a bitcoin exchange. In an email to account holders in September, the firm related that fiat deposits are coming, but it won’t be available for the US. In this regard, Crypto St appears to be similar to Kraken. Kraken launched an impressive demo platform back in May, and went live in September. 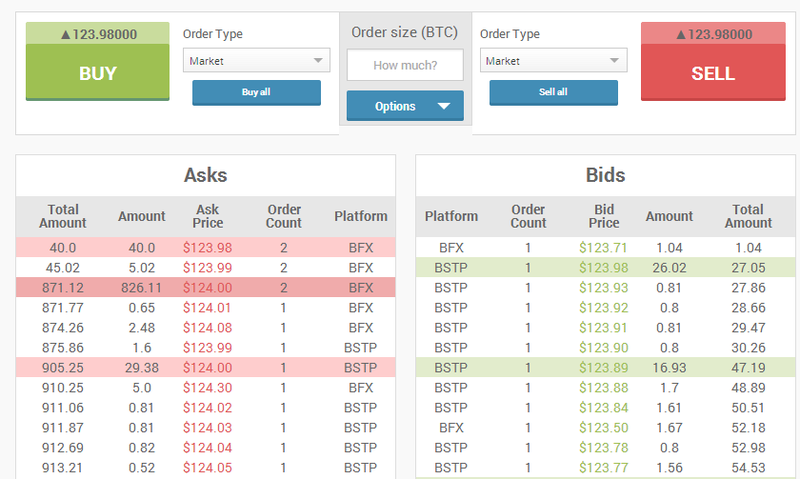 Similar to Crypto St, Kraken has different versions of its order ticket, but has added price charts to its market depth graphs. Funding and trading of fiat to digital is based on account holder jurisdiction. Therefore, not all accounts can trade or deposit similarly. When launching their demo platform, Kraken stressed that it was taking regulation seriously, and would not go live until this issue was resolved. As a result, trading options are limited based on user verification. Among the novel items of Kraken, was the adoption of quoting bitcoin with its ISO currency code, XBT, rather than BTC (Jon Matonis, Executive Director of the Bitcoin Foundation writes about it here). In addition to XBT, the platform offers trading in USD, EUR, LTC, and Ven currency. Holding the platform back though, is limited liquidity (more on that below). Among new bitcoin trading platforms, Coinsetter created some of the most buzz after it raised $500,000 in seed funding. Back in April, Jaron Lukasiewicz, Founder and CEO of Coinsetter, explained to us that the company was aiming to create an ECN style bitcoin platform, with aggregated liquidity from major exchanges, while also creating internal liquidity. 1) In the first part of the year, one of the often mentioned models was that platform providers were expecting to aggregate pricing from numerous exchange sources. However, this seems to be easier said than done. Specifically, the impediments appear to be the existence of wide spreads between trading on BitStamp, MtGox, and BTC-e, as well as funding/withdrawal limitations and delays that exist at exchanges. As such, without uniformity among exchanges, aggregated liquidity appears to be simply too much of a hassle. In terms of the future, this could derail some of the platform providers, as it forces them to focus on creating internal liquidity quickly. One remedy will be the emergence of dedicated market makers who will provide dedicated bid/ask prices to facilitate constant availability of trading. This could be either internal or via third parties. If operated internally, this could be achieved by targeting investment funds to creating liquidity. 2) Regulation continues to be the ‘no man’s land’ of the industry. It’s not just regulation and securing money transfer licenses, as much as creating stable banking partners. In this regard, firms are dealing with traditionally conservative banks to satisfy their transparency and AML requirements. As such, due to the time and expenses involved in forging both banking relationships and receiving regulatory licenses (with the US government closed, this is even more delayed), it could be expected to lead to consolidation within the industry. 3)Another item that we are not seeing among the new launches is leverage. As such, without it, except for user interfaces that could be considered more trader friendly, there isn’t much value being provided in comparison to existing exchanges like BitStamp and CampBX. Also, in terms of trading and usability, it’s hard to argue that Bitfinex doesn’t remain head and shoulders above the new entrants with its existing leveraged trading platform (upgraded interface below). However, as Kraken, Crypto St and Coinsetter, among others, were planned with active traders in mind, we expect to see improvement in terms of leveraged trading soon. Great article! Lot to learn from it. Keep them coming!